Rwanda has unveiled its new brand identity and logo – Visit Rwanda – as part of a wider strategy designed to attract more tourists and greater business investment. At the same time, Rwanda Development Board has just been revealed as the tourism partner for one of the world’s leading football clubs, Arsenal, in a move designed to boost awareness of this vibrant, warm and beautiful East African country. The new identity is inspired by Rwanda’s beautiful landscape, its volcanoes, its flora and fauna as well as the famous, renowned Rwanda traditional art form, Imigongo. The identity will be gradually introduced over the coming months and will underpin Rwanda’s future marketing campaigns at a time when there is substantial interest by global firms to invest in the country and by tourists to visit, as well as by companies keen to host summits and conferences in the capital Kigali. The new Visit Rwanda logo reflects Rwanda’s impressive transformation over the last few years into a modern, safe country with world-class infrastructure and an expanding premium tourism sector. Substantial investment is being and has been made into roads, telecoms, a new international airport as well as new premium hotel accommodation across Rwanda. In addition to the unique opportunities to trek for mountain gorillas in Volcanoes National Park, areas such as Lake Kivu, Akagera and Nyungwe National Parks have stunning scenery with wildlife including chimpanzees, rhino, lions, giraffe, zebra, crocodiles and incredible birdlife. Visitors can experience walks over jungle canopies, cycling, kayaking and birding as well as immerse themselves into Rwanda’s culture heritage at Nyanza and Huye. Clare Akamanzi, chief executive of the Rwanda Development Board, said: “The launch of Visit Rwanda is a major new opportunity for us to showcase the best of Rwanda for tourists and investors alike. 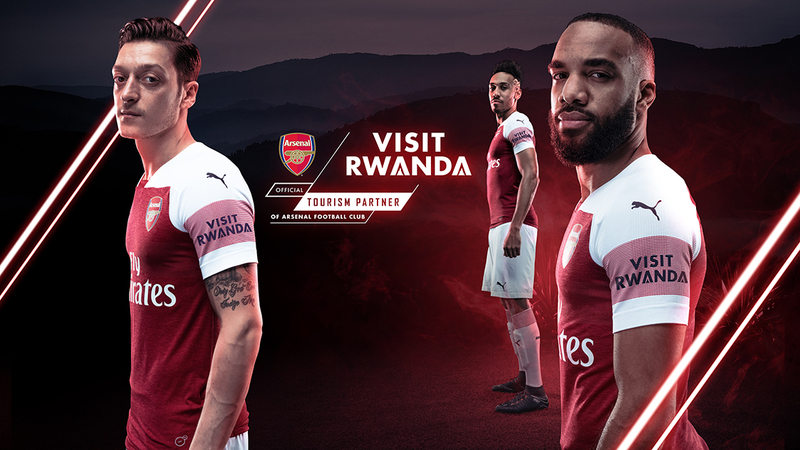 The Rwanda Development Board, through their subsidiary, the Rwandan Convention Bureau, has become Arsenal’s first official sleeve partner as part of the country’s drive to become a leading global tourist destination. The three-year deal will also see Visit Rwanda become Arsenal’s official Tourism Partner. The Visit Rwanda logo will feature on the left sleeve of all teams next season. Arsenal’s chief commercial officer, Vinai Venkatesham, said: “This is an exciting partnership which will see us support Rwanda’s ambition to build their tourism industry. “The Arsenal shirt is seen 35 million times a day globally and we are one of the most viewed teams around the world. Rwanda is ranked as the second easiest place to do business in Africa by the World Bank and has been awarded for its leadership in tourism and economic competitiveness by the World Travel & Tourism Council and the World Economic Forum respectively.